As you have probably noticed earlier today, a chat service is available on our website. From now on, visitors will be just one chat window away from getting commercial assistance fast and to the point. With this implementation, we aim to improve user experience on our website. The service is not intended to replace technical support, but will provide whatever piece of information visitors need to better understand our products and services. The chat is available Monday to Friday, in the first phase for 8 hours a day. We may increase its availability based on the feedback we get. 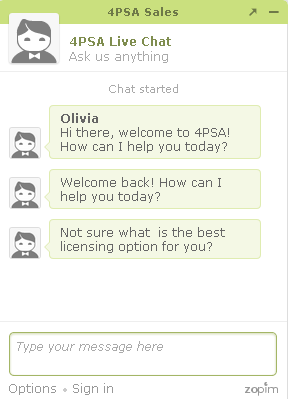 If visitors type a question in the pop-up chat window on bottom right of the screen, an agent will answer back ASAP. If visitors have questions outside working hours, they can leave them as offline messages. An agent will reply as soon as she or he gets back online. Conversations will be saved as transcripts and, upon request, emailed to visitors. Current customers who have an account in our Business Zone no longer need to provide any details to receive such transcripts. Other visitors however need to give their email and phone number in order to receive a copy of the conversation. The chat service supports file transfer, whenever necessary. We’re glad it’s met with such enthusiasm. Thank you.